What Is This Mysterious Glowing Spiral Four Hundred Light Years Away from Earth? 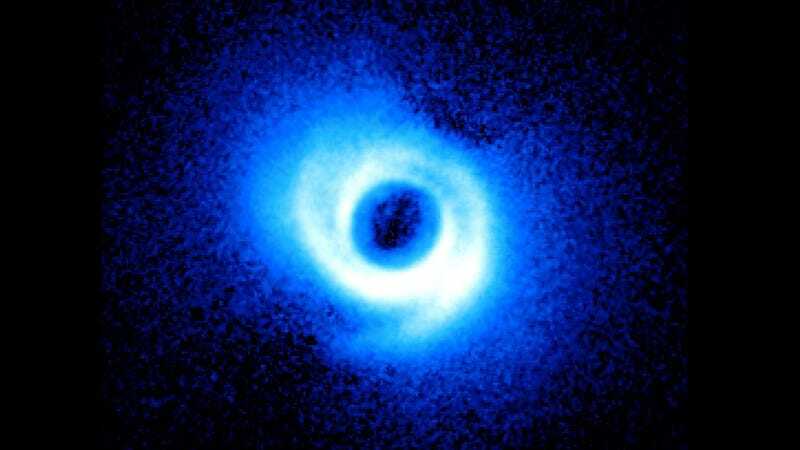 This weird glowing spiral is located four hundred light years away from Earth, in the constellation Lupus. You may think it's a spiral galaxy, like our Milky Way. It's not. It's the strangest star ever found, a new kind. It's a spiral star. Called SAO 206462, it's a completely new finding. According to Carol Grady, an astronomer based at NASA's Goddard Space Flight Center, astrophysicists knew that these spiral stars may exist, but nobody found proof until until now: "Detailed computer simulations have shown us that the gravitational pull of a planet inside a circumstellar disk can perturb gas and dust, creating spiral arms. Now, for the first time, we're seeing these dynamical features." You can keep up with Jesus Diaz the author of this post, on Twitter or Facebook.